Sketch cards have been a big part of the trading card industry for many years. However, much of that has come from the entertainment side. Sports cards have used sketch cards sporadically to mixed results. 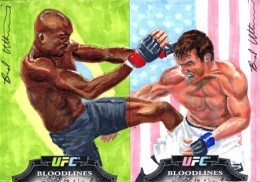 The mini masterpieces made their MMA debut in 2012 Topps UFC Bloodlines. And there's nothing mixed about these results. 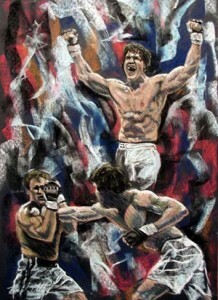 Brad Utterstrom, a long-time MMA artist, poured a ton of time, effort and precision into every card he did. The result? A hundred pack-inserted cards that not only capture a photo-realistic likeness of UFC's biggest names, but capture the essence of what it means to be a gladiator. Simply put, Utterstrom's work is spectacular. Growing up, Utterstrom not only collected cards, he drew his own. Now that's come full-circle with his sketch card debut. We were able to do an email interview with the artist to discuss his experiences on 2012 Topps UFC Bloodlines, his work and what's next. What attracted you to specialize in MMA? My roots in MMA go way back to when I was 2 and started watching pro wrestling -- Portland Wrestling -- with my Grandpa. I was a big fan of rasslin' throughout my childhood, and of course I thought pro wrestling was 'real.' In other words, I thought pro wrestling was what MMA actually is. So I've just always loved watching men beat each other up! As far as why I started drawing MMA fighters? I was a huge MMA fan way back since the late-90s. 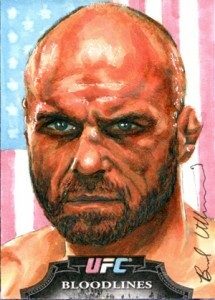 I did my first MMA painting (Randy Couture) as start of a school project around 2001 and posted it on a couple of MMA forums. I got such good response from the MMA community that it just took off from there. I kept getting requests for more MMA work and started focusing my artwork on MMA almost exclusively. Nowadays, there are many amazing artists focusing on MMA subjects, but back then I was pretty much the only one. What's your secret to capturing the likenesses the way you do? There's no real 'secret.' I've always just been most interested in portraits, capturing likenesses, in particular. I work primarily from photographs, and the big key in being able to draw from reference, photographs or life, is being able to understand what you actually see, not what you think you see. A lot of people use the same 'symbols' for facial features when they draw them -- almond shapes for eyes, a curved line for a smile. The key is to ignore those symbols you have in your mind and pay attention to the details of each shape, line, and shadow. Also, when doing sketch cards, I print up each reference photo at the actual size I'm going to draw it, which makes it a little easier to get things accurate. As an artist, who inspires and influences your work? As far as professional artists, Chuck Close is my biggest inspiration. He was basically a photo-realist painter who relied on fine motor skills to get his paintings super accurate and detailed. Then a freak accident caused him to become almost completely paralyzed from the neck down. As he was able to regain more movement, he developed a new style to keep painting realistic portraits. He'd strap a paintbrush to his arm, get a huge canvas, and paint these giant paintings that look like funky shapes and colors up close, but come alive as a portrait as you look from a distance. It's just so fascinating to me that he was able to do such amazing work when faced with such a challenge. You mention on your site that you like to work in different mediums. Do you have any favorites or preferences? Since starting with the Topps sketch cards in August, I have to say Copic Marker is my new favorite medium. I had never used markers before but quickly became quite fond of them. For drawings larger than sketch cards, pastel is my favorite. I tend to avoid painting if at all possible. I haven't painted in probably seven years, but I suspect I will again at some point. Also, some of my favorite paintings of mine are the melted crayon ones. That's also something I haven't done in many years, but I think I'll get back to it. I like the wild colors and the expressive marks that the wax drippings make. About how long does it take you to do a sketch card? I'd say two to three hours, on average. Who have been your favorite subjects to draw? Randy Couture is probably my favorite. He's my favorite all-time fighter, but he's also one of those guys who's just got so much character in his face. Girls are definitely the hardest. Their eyes, their skin, their hair, every detail has to be perfect or it won't look right. Trying to make a girl look beautiful in a drawing is not very forgiving, whereas if you make little mistakes drawing men, half the time it just gives the drawing a bit more character. Have you been commissioned by any fighters directly? Back in the early-2000s I actually had several. Shannon "the Cannon" Ritch, "Wildman" Thomas Denny to name a couple. I also did work for managers or promoters here and there, drawing their fighters for them. I did a series of paintings for Team Quest's gym in exchange for the fighters autographing several prints for me. I'm hoping to do that sort of thing again soon. How did you get involved with the UFC Bloodlines? Topps posted on Twitter that they were looking to do original art in an upcoming UFC set and asked the fans who they'd like to see doing the art. I mentioned this on my Facebook and Twitter pages. A couple days later, Topps contacted me. I was assuming that they wanted to use my existing art as an insert set or something. I was blown away when they wanted 100-plus new sketch cards! I wasn't too familiar with sketch cards at the time, and didn't realize they were a part of any official trading card sets. I was used to doing one or two drawings per week, and the idea of averaging a couple sketch cards every day for two months seemed completely impossible. It was overwhelming, but I was thrilled with the opportunity and had tons of fun with it. I really had to buckle down, but was able to finish them all and was pretty happy with what I had produced. How many cards did you do for the set? Do you have any favorites you're particularly proud of? I did 106. One hundred were pack inserted and the other six were artist returns. 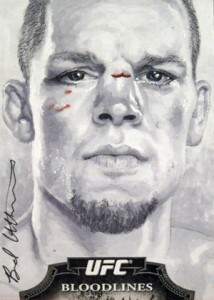 My absolute favorite in the set is the black and white Nate Diaz with a bit of red blood. In general, I liked the monochromatic red, yellow or purple ones better than the full color ones. I also prefer the super close up face shots to full action shots. The full-color Couture is one of my favorites. Most of the others I was really happy with have not surfaced yet -- a purple Melendez, and black and whites of Aldo, Rampage, and Barao. Are you the only sketch card artist in Bloodlines? Yes. Initially, I had heard there would be three or four different artists. Not sure why, but I ended up being the only one. Any future sets coming down the pipeline that you're involved in? Next up for me is Leaf Best Hockey. I'll be doing 25-plus cards. As for MMA, I have no idea if Topps is planning to do more sketch cards in a future UFC product, but I hope so. Do you think sketch cards can catch on more in the sports side of the hobby? I hope so. And it seems to me like it's starting to catch on a bit. I would say the response from UFC fans has been tremendous. I am somewhat familiar with the sketch card craze in non-sports cards, but only since landing this deal with Topps UFC. I tried to do some research on sketch cards to get a better grip on it, and of course as you mentioned most sketch cards are done for non-sports sets. But as I said, Leaf Hockey is next for me, so that's a good indication that sports sketch cards are starting to catch on as well. I think combining the sketch cards with actual fighter autographs would help sports collectors be even more excited for them! Are you still collecting cards today? If so, what do you collect? Starting around the time UFC Round 4 came out, I got into collecting MMA. I try to collect one autograph of each fighter for my personal collection. With the release of Bloodlines I've got a new-found interest in collecting again. I also have a hockey autograph and rookie card collection, but haven't actively tried to add to it in several years. But my hockey collection is mostly the same. I try to collect one autograph and one rookie card of each player. What did you collect as a kid and how did you discover the hobby? As luck would have it, I started collecting with 1986-87 Fleer Basketball. I think I started picking up a couple packs every time I went to Plaid Pantry. At one point as a kid, my collection included seven Jordan rookies! But I always loved to trade in stuff to get new unopened boxes, so over the years I traded in all but one. From 1986 to about 1992, I collected baseball and basketball pretty heavily. When 1990-91 hockey cards hit the market, I fell in love with hockey and switched gears and collected mainly hockey from then on. In the mid-90s I pretty much quit collecting, but I did have a period, from around 1998 to 2002, that I started collecting hockey again. And now that MMA cards are being produced, that is my focus, though I wouldn't mind continuing my hockey collection as well. Are you available for sketch card commissions? If so, what are your rates and how should collectors approach you? I'm available for commissions when I'm not working on an official set. So until I finish the Leaf set, I'll have to hold off. But come March, I'll be back at it. Emailing me is probably the best way to reach me, though I'm also on Twitter and Facebook. My commissions in the past have all been larger than sketch cards, as sketch cards are still quite new to me. But I'm starting to get several requests for them. When I get back to commissions, I will be doing sketch cards for $50 each. We would like to thank Brad for his time and insight. 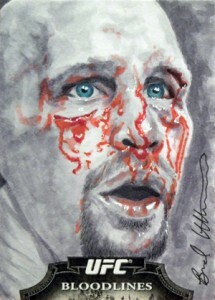 You can see all of his 2012 Topps UFC Bloodlines sketch cards here. His site also has lots of other artwork he's done in the past.